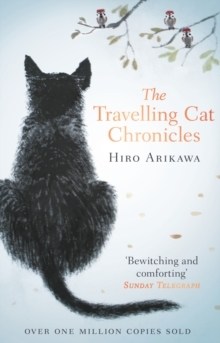 RECOMMENDED BY THOUSANDS OF INTERNATIONAL READERS - the tender feelgood story of a man's journey around Japan with a streetcat. Translated by Philip Gabriel, a translator of Murakami. INCLUDES 6 BEAUTIFUL LINE-DRAWINGSA WATERSONES PAPERBACK OF THE YEAR 2017'Anyone who has ever unashamedly loved an animal will read this book with gratitude, for its understanding of an emotion that ennobles us as human beings, whether we value it or not' LYNNE TRUSS, Guardian`Bewitching... as self-possessed and comforting as - well, a cat' SUNDAY TELEGRAPH`It has the warmth, painterly touch, and tenderness of a Studio Ghibli film - and it is a delight to read' FINANCIAL TIMES'A delightful tale of loyalty and friendship' JOHN BOYNE, IRISH TIMES****************************It's not the journey that counts, but who's at your side. Nana is on a road trip, but he is not sure where he is going. All that matters is that he can sit beside his beloved owner Satoru in the front seat of his silver van. Satoru is keen to visit three old friends from his youth, though Nana doesn't know why and Satoru won't say. Set against the backdrop of Japan's changing seasons and narrated with a rare gentleness and humour, Nana's story explores the wonder and thrill of life's unexpected detours. It is about the value of friendship and solitude, and knowing when to give and when to take. TRAVELLING CAT has already demonstrated its power to move thousands of readers with a message of kindness and truth. It shows, above all, how acts of love, both great and small, can transform our lives. 'Arikawa has a lightness of touch that elevates her story to a tale about loyalty and friendship ... while speaking to our basic human need for companionship' JOHN BOYNE, Irish TimesWHAT READERS ARE SAYING:'I devoured this in just four days. Read it and weep''What an astounding book''Totally enchanting and delightful''Full of hope. Just as good for non-cat-owners as well''Absolutely amazing.